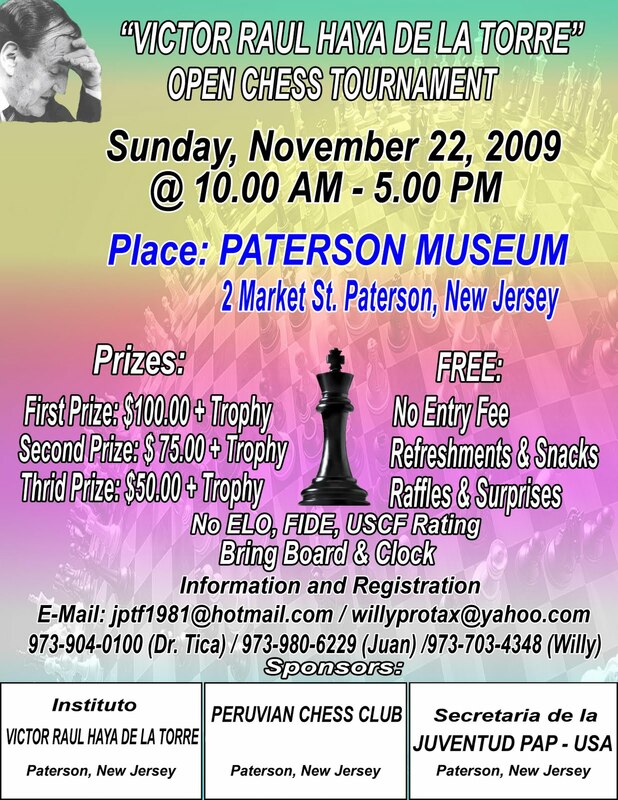 On Sunday, November 22nd, there will be a free, non-rated tournament in Paterson, NJ. The time control & format are not listed on the official announcement (click it for a larger view) but the organizers told me it will be a G/25, 7-round Swiss with rounds at 10 a.m., 11 a.m., 12 noon, 1 p.m., 2 p.m., 3 p.m. & 4 p.m.
Disclaimer : The Chess Coroner and KCC are not involved with this event. Approximately 95% of the java-replays, zips & other files linked from posts 1-327 will be unavailable starting tomorrow, due to Geocities' closing. However, the PGN archives covering that period (September 2006-May 2008) can be downloaded from my sidebar. It may take 4 or 5 weeks to re-up everything and revise the dead links because I also have to rebuild the Checkmate CC site and will be posting quite frequently. An outline of Steve Stoyko's lecture + the games presented. Also on the horizon are the Westfield Championship, Scott Massey's lecture, my 2nd simul in Scotch Plains, the November GSCL matches and the Kenilworth Quads. I'm breaking my hiatus to complain about the Newark Star-Ledger pulling the chess column from its 10/18 issue. I was disappointed to find that the 10/18 issue of the Newark Star-Ledger did not feature the usual chess article by Steve Doyle & Peter Tamburro. Their column, long a weekly staple for the NJ chess community, has been the NY-area's best for the past several years. It provides better analysis than those in the Times and Post while highlighting games played by local amateurs! In the future, I would appreciate that you don't skip the Doyle/Tamburro pieces. Quite frankly, they are the only reason I buy your paper on Sunday. As noted in the Sunday section, the chess column will return next week. We had to hold it this week because it came in too long for us to publish. Typically, Doyle and Tamburro don't write about matches that are longer than 30 moves, which is the ideal for the space we have allotted for ChessMate. Yesterday's column, which I pasted below (without the puzzle), was a match that went for 121 moves. The chess columnists wrote about 61 moves. I just don't have that much space for chess. And, yes, we did ask them to show restraint moving forward. A relevant side note, I waited all day Sunday and yesterday to see if there were any other complaints about chess not appearing in the paper, and sadly we only had a handful of readers who called or emailed. On the other hand, when I hold Bridge or when the TV Jumble puzzle moved, I had an avalanche of mail. I hope you enjoy the column below and that my reply satisfied your query. Thank you for sending the omitted column. I realize there are space requirements but good games are usually more than 30 moves long. In shorter games, one person typically plays well and the other plays poorly. So, you see, 30 should not be the guide. 50 moves would be more appropriate. I would be in favor of occasionally dropping the chess puzzle to fit in a longer game. 7 games from last night's Garden State League matches have been uploaded. Links can be found on the league's blog. 5 games from the recently concluded Sy Fish Memorial have been uploaded in java-replay and zipped PGN. Sorry for the week-long delay. Getting Kenilworth's teams organized & the GSCL site finished took priority. Last night, in Garden State Chess League action, The Kenilworth Karpovs beat the defending champion Kenilworth Kortchnois 2.5-1.5 while the Kenilworth Karpovs drew Staten Island 2-2. Details on the league's blog. Games, when posted, will also appear there. 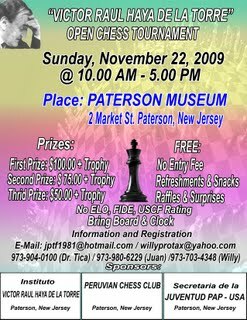 The 2009 KCC Events Calendar has been updated to include our upcoming lectures and Garden State Chess League matches. The Kenilworth Chess Club will be hosting 3 lectures this fall, all of which are geared toward chess improvement. On October 15th, FM Steve Stoyko will present "Evaluating Chess Positions, An Introduction". On October 29th, NM Scott Massey will show us "How To Improve At Chess". On December 3rd, NM Yaacov Norowitz will speak about "Color Complexes". The lectures will begin at 8:15 or 8:30 p.m. and the admission price for each is $5.00 per person. Non-members are welcome. The new Garden State Chess League site is finished. Please visit it, participate in the polls and bookmark. All 2009-10 match results & games will be posted there. 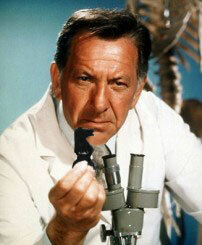 The Chess Coroner will just provide headlines and links. The sidebar link no longer directs to the soon to be defunct Geocities site. The Kortchnois have added Mark Schwarcz. NM Mark Kernighan has been re-assigned to the Kramniks. Geoff McAuliffe has been transferred to the Kortchnois. For the full rosters see post #576. One more move... Ted Mann added to the Kramniks squad. FM Steve Stoyko won the 2nd Sy Fish Memorial with a 4-0 score. Mark Kernighan, Ken Chieu & Ian Mangion tied for 2nd place. David Pawlowski, Mike Wojcio & Lou Sturniolo split top U1800 honors. Joe Renna was the top U1500. Shiffman received a full-point bye. Replays, PGN & a table will be uploaded tonight, sometime after the N.Y. Rangers' game. If you have not been assigned and would like to play please contact John Moldovan. Those who have been placed on a team but are not interested in playing should contact their captain. Only 8 or 9 guys are willing to play every month. So, if possible, please make yourself available for 1 road match. Once a player plays for a team during the 2009-2010 season, he is bound to them for the season. However, those who have not yet played can be traded or interchanged; if a team needs someone to play on the road or with a certain rating, etc. The captains should work-out such transactions.